Returns and refunds are classified into the following categories: (I) Item not received, (II) Item not as described, and (III) any reason returns. The following principles apply for returns and refunds regardless of the reason. • Delivery is delayed and there have not been an updates for over 30 days. • Items are held at one location such as shipping company or sorting facility for a long period of time over 30 days. After requesting a Return and Refund request with turcobazaar.com, if the Merchant cannot provide information regarding delivery such as a valid shipping tracking number and there are no further updates from a shipping company beyond 10 days, the Merchant will be responsible for providing a refund. If delivery information for packages shipped via UPS, DHL, FEDEX, TNT or other methods can not be verified or lacks a shipment tracking number, the Merchant will be responsible for the shipment if a Return and Refund be requested. If you’ve requested a “Return and Refund” request and the Merchant does not provide valid shipping details, a refund will be issued as long as 60 days has passed since the order was shipped by the Merchant. This also applies to replacement items or orders. 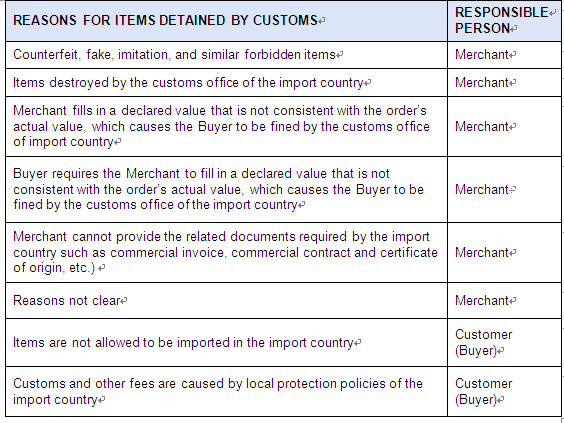 If an order is detained by a Customs office or is waiting to clear customs, and there are no updates on the delivery information within 10 days, the buyer should provide a photo of the Customs Letter and the Merchant will be responsible for the shipment except for criteria listed in table 1. If an item is delivered to the wrong address, and a return and refund is requested, the Resolution Center will verify whether or not the item was sent to the wrong address. Proof of delivery information will be requested from the Merchant and if the delivery information is valid, no refund and return will be given or processed. Proof of delivery information should include item recipient’s name, delivery address, postal code, and country. If an item arrives to the delivery address and the customer (buyer) refuses to sign for the item because the package arrived damaged, the Merchant will be responsible for the shipment and a return and refund will be processed by turcobazaar.com. If an item arrives to the delivery address and the customer (buyer) refuses to sign for the item for reasons other than a damaged package, the customer (buyer) will be responsible for paying return shipping fees prior to a refund being processed by turcobazaar.com. %35 restocking fee will be applied. If a shipment is either lacking a tracking number or the tracking number cannot be found on an official shipping or logistic company’s website after 7 days of order placement, the Resolution Center can assist in validating the shipping or tracking number. If the Merchant does not provide a shipping or tracking number, the Merchant will be responsible for providing a refund. If shipping or tracking number is valid; however, the delivery information is inconsistent with the order, the Merchant will be responsible for providing a refund. An example of this situation is when the delivery country is USA, however, the tracking information shows that the delivery country of France. An item is defined as not matching the product description if upon receipt it is damaged, defective, or has other quality issues where the item cannot be used for its intended purpose. For electronic items or those where a product model number is included in the item description, item photo, or item title, the assumption is that these items have all the functionality of the product model number. In the following situations where a product is believed to not match the item description, valid information such as a photo or video of the item should be provided to the Resolution Center where a return and refund will be determined. 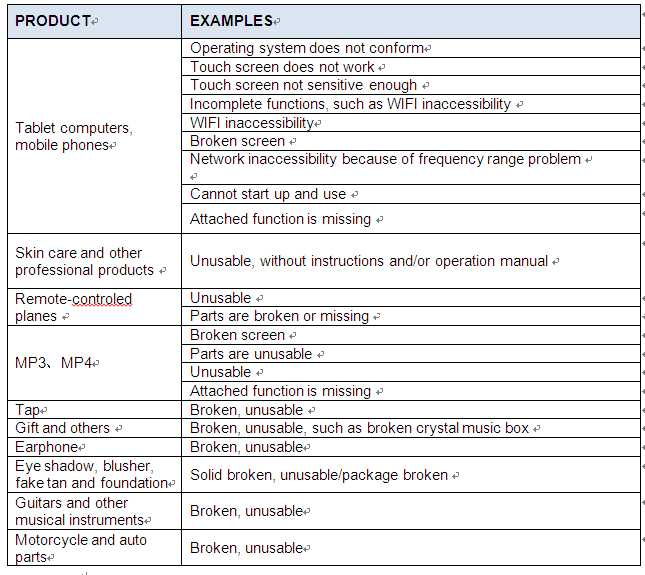 For items where there are serious defects, returning the items may not be necessary. Table 2. 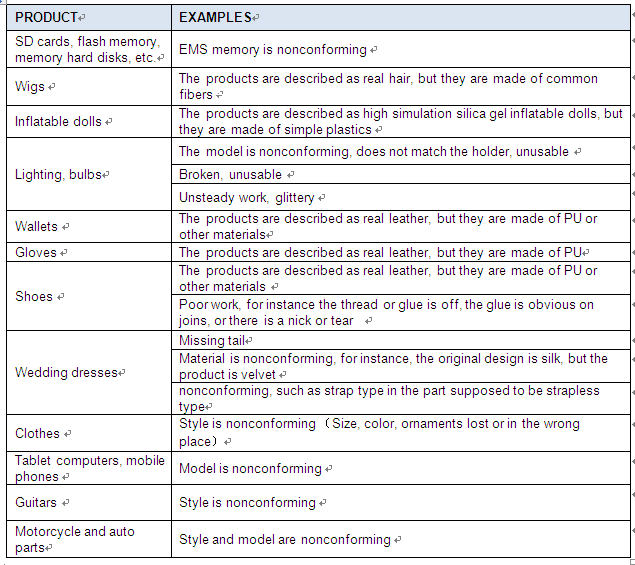 Examples of whether an item qualifies as significantly different from description. Table 3. 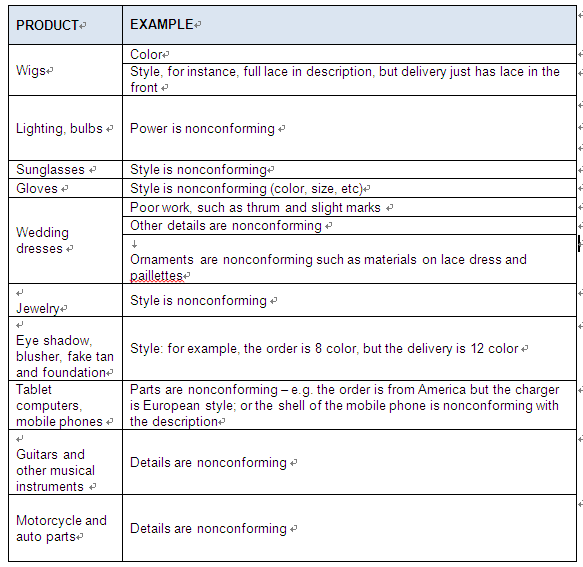 Examples of whether an item qualifies as not as described. If an order received has less quantity than described, the Resolution Center will review the photo evidence received from the buyer and freight weight certification to determine whether a refund will be issued. If an order does not meet described measurements or there is a misunderstanding of measurements, the Resolution Center will review the item description and adhere to global recognized measurements. For example, for earrings, 1 piece would refer to 1 pair of earrings. If an item received differs from the product description because it is fake or misstated, the Resolution Center will review as to whether a refund will be issued. Generally, photo or video of the item will need to be submitted. An example of a fake item is where the item description states the material is gold, but the item is of another type of material. If an item received infringes or violates an authorized brand holder’s intellectual property rights, the Resolution Center will review as to whether a refund will be issued. Generally, photo or video of the item will need to be submitted. If an item differs from the item listing's photos and/or size, color, appearance, style, model or material, the Resolution Center will review as to whether a refund will be issued. For color or style discrepancies, options available include return and full refund, or partial refund. If the item is returned, the Merchant will be responsible for the return shipping fees. For size discrepancies, the Resolution Center will review information provided via photo or video as to whether a refund will be issued. Table 4. Examples of items not as described due to color, style, or size. If a refund and return is requested on an item for other reasons such as “I do not like the item” or I do not want the item”, and the seller agrees to the proposal, the Customer (buyer) will be responsible for paying return shipping and freight fees. “Any reason returns” must adhere to time limits set by the Merchant. turcobazaar.com’s Resolution Center will enforce its policies according to the general principles stated. If a Merchant (Seller) or Customer (Buyer) has any disagreements on the decisions made by the Resolution Center, an appeal may be made by sending an email to info@turcobazaar.com. In such cases, turcobazaar.com will make note of the appeal and provide a result within 10 business days. If the person making the appeal is required to cooperate in providing appeal materials during proceedings, they should cooperate within 5 days. Otherwise, turcobazaar.com will deem the person making the appeal as giving up their right to appeal. If the buyer is unhappy with the product, he can open a return case in 14 days of delivery. Customer (Buyer) can not open a return case if the return period (14 days ) is expired. Customer (Buyer) can not claim "item is not as described, came in damaged condition" after 14 days passed from the delivery date. By purchasing from TurcoBazaar, Customer (Buyer) accepts that 14 days of use is sufficient to understand that the item is as described.